The 140CR's user-friendly compact body with its understated black finish looks great anywhere. 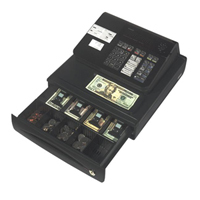 Equipped with security and other advanced functions, it offers all the convenience small and mid-sized retailers require. Flashing approproate input for time and date setting when needed.The 140CR features 20 departments with five keys using four shifts. Popular items can be registered to a large department key for ease of use, and others to a regular-size key to categorize item registration. Removable key caps can be used to customize the description of keys. Add-in and Add-on tax system makes all tax operations simple and fast.